What is this Bill of Sale for? A bill of sale for a motor vehicle is often regulated by the state where the sale takes place. In fact, some states provide a specific bill of sale form that must be used. Not all states require a bill of sale for a motor vehicle, but it does act as proof of ownership and makes an excellent personal record. Information in a bill of sale for a motor vehicle includes a description of the vehicle, the VIN, and the odometer. It will also include the price as well as the names of the buyer and the seller. It should also be signed and dated by both. It may need to be notarized depending on the state. General items may be sold with a bill of sale. Common items include used furniture, electronics, clothing, and jewelry. A bill of sale for a general item doesn't need to be notarized. 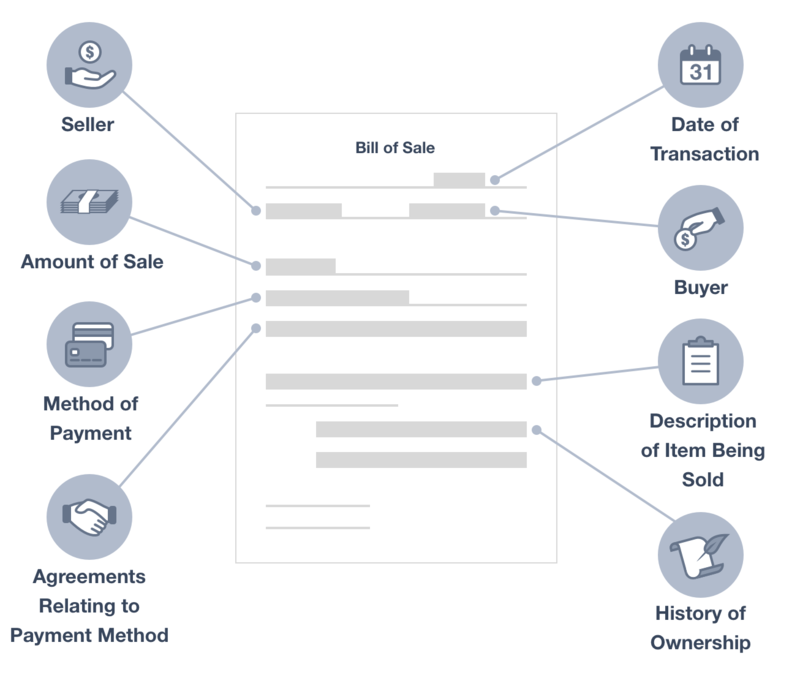 A bill of sale for a general item includes a description of the item, the names of the buyer and seller, and the price and payment terms of the sale. It is also signed and dated by both parties. A bill of sale for a boat is used to document the sale of a vessel. Boats must be registered in the state where they are used. This usually includes handmade boats. A bill of sale acts as proof of ownership during the registration process. A bill of sale for a firearm is used as a personal record. While there are a few cities that require gun registration where you may need to provide proof of ownership, bills of sale are usually not a legal requirement. A bill of sale for a firearm should include the make, model, caliber, and serial number of the gun. Property Location - This section of the bill of sale form specifies the location of the item being sold. Typically this includes only general location information: city, county, state, zip code etc. Our bill of sale template also includes a brief description of the item being sold. Seller(s) - This section includes the main seller's contact information, including his or her full name and address. It is also where any additional sellers are noted. Buyer(s) - This section provides the contact information of the buyer. It also lists information about any additional buyers. Price - This lists the purchase price the buyer will pay for the property in question. Typically subtotals are not itemized on a bill of sale, only the total price. The Form of Payment - This specifies what payment method the buyer will use. Options include cash, personal check, certified check, money order, etc. Sales Tax - This section specifies how sales tax will affect the price. It is either included in the prices or added to the price. 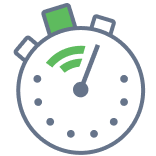 Property - This includes the date of property transfer. It also specifies whether the item is being sold "as is" or under warranty. If the item is being sold "as is," the bill of sale states that the buyer has had the opportunity to inspect and approve the item's condition. If you are buying or selling a motor vehicle, be sure to include the VIN (Vehicle Identification Number), license plate number and odometer reading. Witness Information - This section is only pertinent if a witness will be present to sign the bill of sale. It includes the witness' full name, address and other contact information. The witness can either be a public notary or a party agreed upon by the Buyer and Seller. As-is - The as-is clause certifies that the buyer is agreeing to purchase the item in its current state at the time of sale. VIN (Vehicle Information Number) - A VIN is a car's serial number; it is 17 characters in length and will correspond to the manufacturing details of the car, such as the specific model, the location of where it was built, and the year that the car was made. Gift - This part of the bill sale is used to identify whether the item is being sold as a gift to the recipient. If the gift box is checked on a bill sale, it will carry specific tax stipulations for that calendar year. Trade-In - When you are trading in one item for another, the trade-in bill of sale will certify the current value of each item to ensure that each party is receiving proper value for the exchange. A bill of sale is a document used in the transfer of an item's ownership from the person selling it (the Seller) to the person purchasing it (the Buyer). It contains all pertinent information regarding the sale, including contact information for the buyer and seller, warranty information (if applicable), date, time, the price paid, and other pertinent information of the transaction. Day-to-day bills of sales come in many forms and can be as minor as a receipt for a pack of gum, or as major as a record of a large, and expensive purchase, such a boat or a car. What is the difference between a Bill of Sale vs Title Transfer? It’s important to note that a bill of sale does not prove ownership. Its purpose is only to record a transaction between two parties. A title transfer, nonetheless, proves ownership by transferring the title of the item (car, house, boat etc.) to its new owner by officially notifying the governing state that the item has been sold to a new owner. Create a free Bill of Sale in minutes with our professional document builder. Love free forms? Share the joy! What are the components of a bill of sale? When buying or selling property, a bill of sale template is a great way to certify that the transaction is being made. It is also a means of legally documenting the details of the transfer of property, as it will typically contain extensive information on the transferred item(s) along with the contact information of the buyer and seller. Furthermore, a bill of sale is a relatively simple form that could even be found through an internet search engine. You do not need to be an attorney to create a bill of sale, and if you can locate a free bill of sale template online, you might spare yourself the expense of hiring an attorney or legal expert. On the other hand, it is not a good idea to choose a free bill of sale template at random. If you're going to create a bill of sale, you should at least be familiar with the various parts of such a document. After all, this is a legally binding document that could cause many problems if the essential parts aren't all there. Let's take a look at some of the components that you should expect to see in a bill of sale template. What are the important details in a bill of sale? For one thing, if all of the basics aren't there, then you don't have a usable bill of sale template. Even if it's free of charge, avoid any template that doesn't indicate a place to write or type the names of the buyer and seller, along with their addresses and telephone numbers. If also there's a place in the template to include email addresses, that's even better. Next, check to see if there is a section where the seller and/or buyer can indicate the details of the property that is to be transferred. There should be sufficient room in this section to leave highly detailed information about the property and its at the time of purchase. Keep in mind that if more than one item is encompassed within the transaction, it may be necessary to itemize or list the particular items separately. If this is the case in your situation, the bill of sale template that you choose should allow for this. The next thing to remember is that your bill of sale template must specify the financial details of the transaction. Upon viewing the form, one should easily be able to tell how much the property was sold for and when it was sold. If there is sales tax involved, this should be noted as well; moreover, the method of payment (such as cash) should be clearly indicated in the template. Finally, any template should have a place for at least three signatures: the buyer(s), the seller(s), and at least one witness or notary. The bill of sale, if written properly, will have places for printed names, signatures, and dates at the bottom of the form. After you get to the bottom of the document, double-check it to make sure that it looks professional and is free of spelling and grammatical errors. If your bill of sale template passes muster, you'll have a reusable legal document that can give you peace of mind anytime you're buying or selling a tangible piece of property. What are the legal considerations of a Bill of Sale? In the world of legal documents, the bill of sale resides somewhere between a simple cash register receipt and a formalized title or deed. The bill of sale represents a record that a seller has sold an item of possession to a buyer. This legal document is usually drafted by the seller, and it signifies a record of the sale and intent to transfer ownership. The bill of sale form will include the details of the transaction, and although it will typically be signed by the seller, it does not have the legal force of a title or deed. Bills of sale do not prove ownership; rather, they only show that a transfer of ownership occurred. Nonetheless, the bill of sale can prove as useful evidence that the transaction did indeed take place. It can also be helpful if there is a dispute as to the details or conditions of the transaction. From the buyer's point of view, a bill of sale is a good way to get the specifics of a sale in writing before a monetary exchange is made. For the seller's perspective, a bill of sale can be helpful in maintaining records for accounting purposes. Do I need to read each word of a bill of sale? While it is true that a bill of sale form is a fairly simple document compared to other legal documents, it still has legal force and should be taken seriously. As with any legal document, it is never a good idea to sign it without reading and understanding all parts of the document, including the fine print. This is especially true for the buyer, as it is usually the seller who has composed the bill of sale (or hired someone else to compose it). Therefore, while both the buyer and the seller must consider the terms of the sale very carefully, it is especially important for the buyer to understand the legal considerations of the bill of sale. One thing to know is that a bill of sale template acts much like a contract, meaning that if written and executed properly, it is legally binding to all signers of the document. For that reason, it is imperative that buyers and sellers not only read the bill of sale form carefully but also ascertain that all of the information is accurate and complete. It is also important to realize that the seller must have full rights to sell the property listed on the bill of sale form; otherwise, there could be serious legal repercussions for the seller. Hence, it is advisable for the buyer to request that the seller produce documentation showing that he or she has full ownership rights to the item(s) being sold. If this documentation cannot be produced upon request, the buyer should be hesitant to sign a bill of sale. How should I research my bill of sale? To better understand the legal aspects surrounding a bill of sale, it is important to go online and search for a sample bill of sale and look at the legal language used in these forms and take note of their common terms and elements. However, be sure to verify the quality of any legal form if you actually intend to use it. Alternatively, many people are looking to sell items on behalf of charities at auction events. If you are are seeking donations for a charitable item, you should look into procuring a donation request letter. With this letter, as opposed to a bill of a sale, you can ask for contributions to your charitable cause while conducting an auction for a non-profit of your choice. Nonetheless, using a bill of sale form is an excellent way to protect the legal rights of buyers and sellers. Understanding the legal issues pertaining to bills of sale is an essential step in keeping all parties satisfied with the transaction. Our team at FormSwift wanted to determine the best and worst states to buy a used car. To do so, we evenly weighted the following factors into a final score out of a 100 point baseline for each state, which represented how much an individual would pay in associated fees - monthly car insurance rates, average gas prices, and dealer documentation fees. States with lower totals ranked better than states with higher totals. The datagraphic below shows states from best to worst. A bill of sale records important information about the exchange of personal property. It will give information about the buyer, the seller, and the property that is being sold. A Vehicle Bill of Sale is a legal document evidencing the detail of exchanged ownership of a vehicle. It establishes an 'as is' assumption that the buyer accepts the purchase in its current condition. The bill details names and addresses of buyer and seller, date of sale, price, vehicle registration and other details. If you're buying or selling a boat, you need a boat bill of sale. This document displays information about the buyer, the seller, and important information about the boat that is being sold. A lease agreement establishes the terms and conditions for borrowing or rental of property, be it real estate, equipment or other asset. It details the parties, the leased property, duration of the lease, expectations, rights and obligations of both parties. When signed it is legally enforceable.